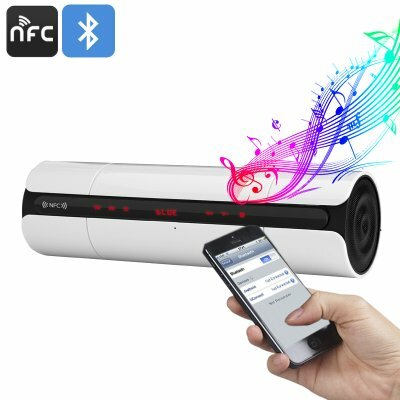 Successfully Added Wireless Bluetooth Speaker - Built-In-Mic, NFC, 32GB TF Card Slot, 3D Sound Technology, 4 Hours Play Time, FM Radio (White) to your Shopping Cart. With this stylish Bluetooth speaker you will be able to carry along your favorite tracks wherever you go. Thanks to its extremely compact design and light weight, this portable speaker can be easily carried around. Whether you spent your day at the beach and want to enjoy your favorite tracks while enjoying the sea breeze, or simply like to listen to some fine tunes while sitting comfortably at home – with this wireless speaker you can be assured to enjoy the finest audio at any given moment. Coming with the latest 3D sound technology this wireless speaker is guaranteed to deliver an absolutely stunning audio experience that suits the needs of any audiophile out there. Simply pair this Bluetooth speaker with your smartphone and you will be able to listen and share your favorite tracks straight from your music library. Supporting NFC, this portable speaker further enhances your user experience as now you will be able to simply put your NFC supported smartphone on top of the speaker which will then sync automatically with it – allowing you to listen to all the fine tunes saved on your smartphone. Packing an epic 1200mAh battery, this NFC Bluetooth speaker is capable of offering a stunning 4 hours play time on one single charge – providing you with plenty of time to enjoy your favorite songs while on the move. Additionally, this wireless NFC speaker also supports FM frequencies, giving you the option to listen to the latest songs, news programs, weather forecasts, and a whole lot more no matter the time of the day. The next time you head out on a fun packed day trip with your friends or family you can leave your house with confidence as, with this Bluetooth speaker at your side, you can be assured that you and your loved ones can enjoy some fine tunes no matter where you are. Thanks to its rounded white body and red backup LED light, this wireless speaker features an extremely stylish design – making it not only suitable for outside use but also a true asset to the interior of any modern household. Coming with a touch pat and holding no external buttons this Bluetooth speaker can be easily operated. Not only does it allow you to listen to tracks in stunning audio quality, it also lets you engage in hands-free phone calls as it features a built-in microphone. From now on there will be no need to search for your smartphone when you receive an incoming call - with this NFC speaker you will be able to simply answer any phone call straight from its touch pat.